The Nashville Sounds Baseball Club returns home to First Tennessee Park on Tuesday, April 16 to begin a seven-game homestand. 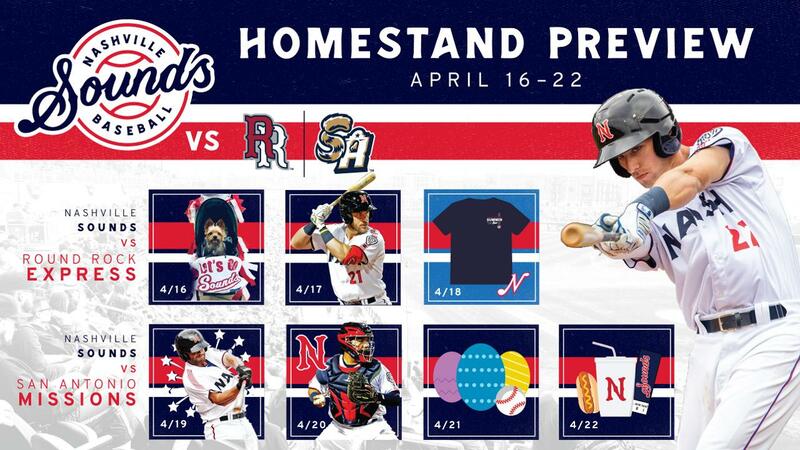 The Sounds welcome the Round Rock Express (Houston Astros) for three games from April 16-18 and the San Antonio Missions (Milwaukee Brewers) for four games from April 19-22. Tuesday, April 16 vs. Round Rock - 6:35 p.m.
- Gates open at 5:30 p.m.
- Tito's Tail Waggin' Tuesday - Fans can bring their four-legged friend to First Tennessee Park every Tuesday in 2019. Tickets start at $25 ($20 for humans; $5 for dog). Proceeds from all dog tickets will benefit Agape Animal Rescue. Limit of one dog per human. Please note all dogs must enter through the Right Field Gate on 5th Avenue. The Vanderbilt Health Picnic Place will be reserved for all dogs and owners in attendance. All dog owners are required to sign a waiver and present proof of updated rabies vaccination. Wednesday, April 17 vs. Round Rock - 6:35 p.m.
- All fans win on Winning Wednesday presented by Pepsi at First Tennessee Park. The first 1,000 fans through the gates are guaranteed a free prize. Additionally, all fans are welcome to runs the bases after the game if the Sounds win. Thursday, April 18 vs. Round Rock - 6:35 p.m.
- Gates open at 5:35 p.m.
- Summer Tour T-Shirt Giveaway presented by Ashley HomeStore to the first 2,000 fans. - Throwback Thursday presented by Budweiser - the Sounds will wear throwback uniforms to commemorate the team's original uniform style from 1978. Fans can purchase Pepsi fountain soda and Budweiser products at a discounted rate. Friday, April 19 vs. San Antonio - 6:35 p.m.
- FOX 17 News postgame fireworks presented by Koorsen Fire & Security. Saturday, April 20 vs. San Antonio - 6:35 p.m.
- Easter Weekend All-You-Can-Eat Cookout - Fans are welcome to join the Easter celebration party on the Budweiser Club Deck. Tickets start at $60 for Club Level and $65 for Diamond Club and includes a ticket to the game, all-you-can-eat buffet on the Budweiser Club Deck, Budweiser and Bud Light draft beer, soda, water & tea, commemorative Sounds sunglasses and exclusive access to the Brauer Club Lounge. - Enjoy Saturday at the Park with visits to The Band Box and our Family Fun Zone in the right field corner. Sunday, April 21 vs. San Antonio - 2:05 p.m.
- Gates open at 1:00 p.m.
- Youth Sports Day - Players and families of Middle Tennessee youth sports leagues are eligible for a $2 discount on tickets and can participate in a pregame parade on the field. Fans must contact the Nashville Sounds sales team to receive a discount code. - Middle Tennessee Hyundai Dealers pre-game autograph session with select Sounds players from 1:00 to 1:15 p.m.
- Postgame Kids Run the Bases (12 & under) presented by First Tennessee. - Postgame Family Catch on the Field. Monday, April 22 vs. San Antonio - 6:35 p.m.
- Kroger Plus Monday - Score a "Family 4-Pack" that includes 4 Select section tickets, 4 hot dogs & 4 fountain sodas for $44 when fans show their Kroger Plus card at the Sounds Ticket Office. Offer is subject to availability. - Austin Peay State University Night - Austin Peay students, faculty and alumni are eligible for a $2 discount on tickets. Discount code must be received by contacting the Nashville Sounds sales team. Seniors and Military families can enjoy a $2.00 discount on single-game ticket prices at First Tennessee Park. The offer is valid for any reserved seat section on Sunday through Wednesday games - subject to availability. Offer valid for up to four (4) tickets per I.D. (Seniors 55 +, government-issued military I.D. required at ticket office; no phone orders). The Nashville Sounds' media partners for weekly promotions include Nash FM 103.3, 104.5 The Zone, iHeartRadio, WSMV News 4, FOX 17 News, 96.3 JACK fm and Mix 92.9. The 2019 season is the 42nd in Nashville Sounds franchise history and first as the Triple-A affiliate of the Texas Rangers. Single-game tickets are available now by calling (615) 690-4487 or by visiting www.nashvillesounds.com.